"This one was pretty hard to pull together, but we know what`s coming. An epiphany of sorts. 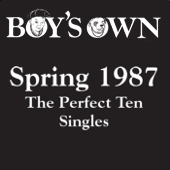 In the issue of Boy`s Own published in Spring `87 there were no "Charts" as such, just a couple of notes in the margins: Uncle Andrew`s 5 Geetar Greats, 5 Shake `N` Finger Pop recommendations from Norman Jay. Country and feedback. Funk and Disco. Interviews with Big Audio Dynamite and Voice Of The Beehive. The issue from Summer `87 adds a list of 15 "Perfect Ten Singles": The Smiths, The Triffids, "Golden Age" US Hip Hop and a few new UK mutants thereof. It`s worth noting that House has all but disappeared from the fanzines, apart from Farley commenting on the floor-clearing effect of the music in London`s clubs (alongside lamenting popularity ruining Rare Groove and predicting a Disco revival for 1988)."